A new thing we have started with the Digital Dozen ladies is celebrating each others birthday by the birthday girl selecting an inspiration photo, and then anyone who can, creating a mani based on that photo. This month it's RoseLynn from Manicured & Marvelous birthday and she chose a piece of art from Lynda Lehmann called Legends of the Galaxy. 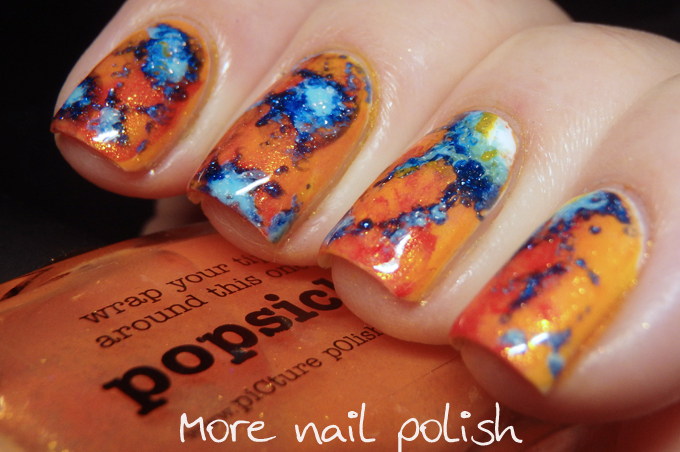 This was such a great image to recreate nail art with. 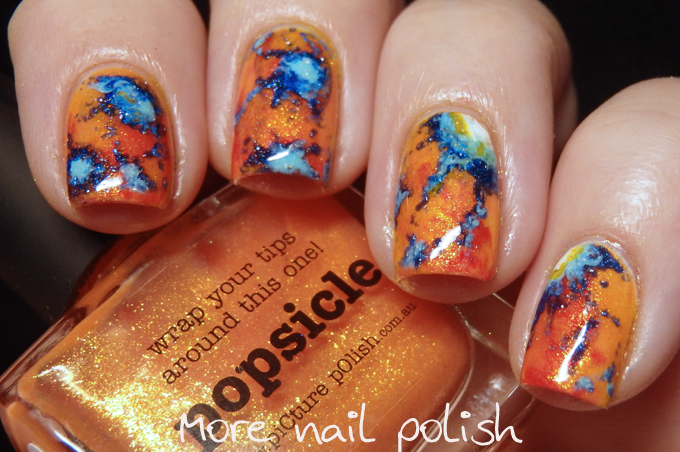 I used a whole range of Picture Polish shades. 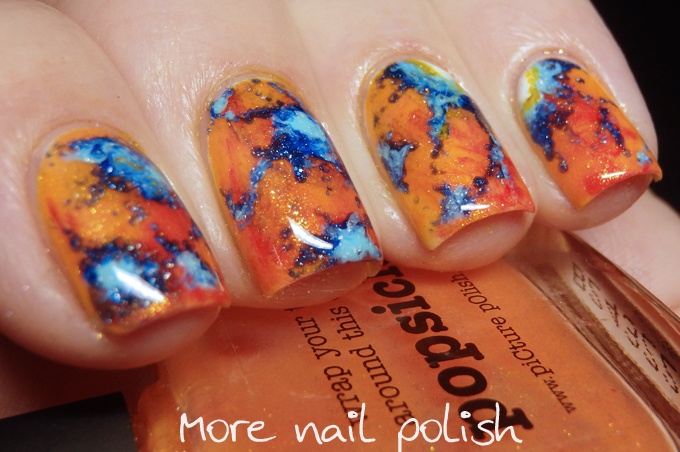 The orange base was Popsicle, and I used little bits of vegas, freya's cats, sunflower, saltwater and bright white. 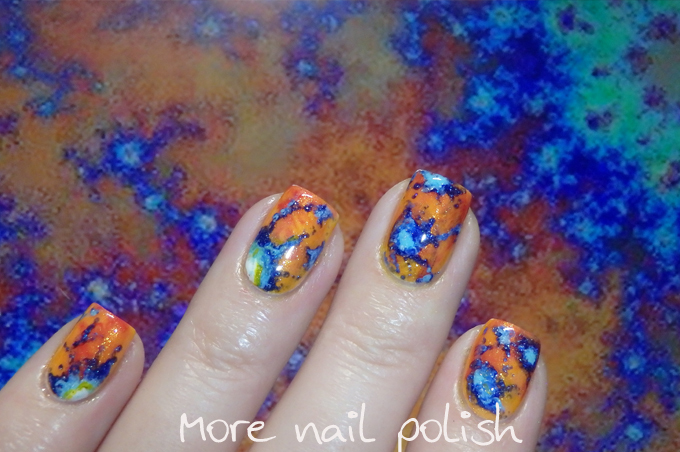 I hardly ever wear orange nails so this was a fun combination to wear. Wow, this is spectacular! Awesome recreation of the inspiration photo, perfect colors. Fabulous job, I love it! That's beautiful, and totally perfect! What technique did you use? It reminds me of enamel on metal! Thanks Laurie, the base is a stamped smoosh of the orange and red polishes, and the rest is done with a tiny dotting tool. I love this. All three are so different. I love your base orange too! Thanks Amanda, all three are goregous. I love seeing how we all interpreted it differently. It looks spectacular and so 3dimensional!! 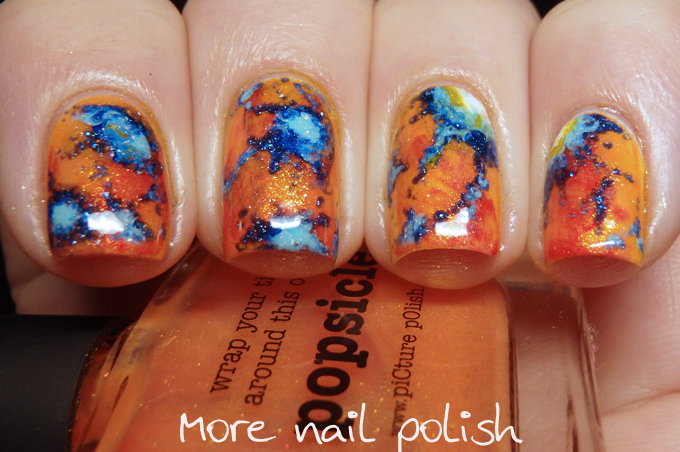 Wow, this is actually one of my favorite nail arts you have ever posted! I LOVE the contrast between the orange and blue tones. So so pretty. Your interpretation of this looks really cool.